What Is the “CHIP Cliff” and How Can Congress Fix It? On January 22, 2018, Congress included a six-year extension of the Children's Health Insurance Program (CHIP) as part of a continuing resolution (CR) to keep the federal government funded on a temporary basis. Funding for CHIP had expired 114 days before, at the close of September 2017. States were continuing to operate their programs with unspent funding from FY 2016 and FY 2017 and a $2.85 billion appropriation from Congress in the CR passed in late December. However, by this past week, states were rapidly running out of any funding. A report by Georgetown's Center for Children and Families had estimated, "If Congress fails to approve long-term funding for CHIP in January, nearly 1.7 million children in separate CHIP programs in 21 states with shortfalls in March 2018 could lose coverage by the end of February 2018." 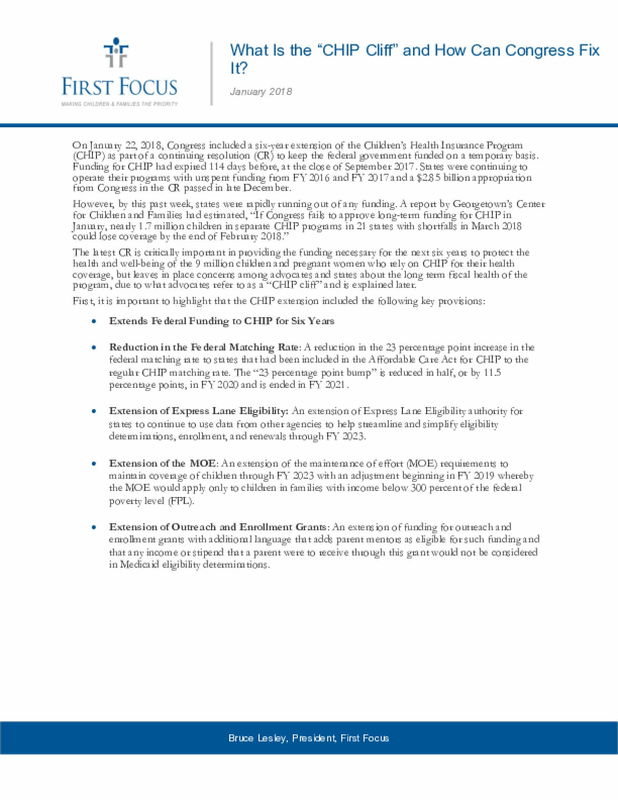 The latest CR is critically important in providing the funding necessary for the next six years to protect the health and well-being of the 9 million children and pregnant women who rely on CHIP for their health coverage, but leaves in place concerns among advocates and states about the long term fiscal health of the program, due to what advocates refer to as a "CHIP cliff." Copyright 2018 by First Focus. All rights reserved. Title: What Is the “CHIP Cliff” and How Can Congress Fix It?